Dead men tell no tales, we are assured, but that didn't stop William Holden spinning a fine one after his watery demise in nutty Norma Desmond's swimming pool in Sunset Boulevard. Having the jump on that particular narrative device by two years is Scared to Death, a rarely seen murder-mystery tale from 1947 that has the distinction of being the only colour feature made by a certain Bela Lugosi. There are few horror fans who do not have a serious soft spot for Lugosi. A true genre icon who gave us the most commonly held conception of Count Dracula, he may well hold some sort of record for unrealised potential, landing with a splash and a few neat roles and then bouncing from one second-rate project to another before drug addiction and Hollywood disinterest sent his career into nosedive. His famed partnership with Edward D. Wood may have made for a great Tim Burton movie, but this effectively erected a tombstone over the actor's career, which notoriously concluded halfway through Wood's crowning achievement, Plan 9 From Outer Space. The 1947 Scared to Death was made when Lugosi's career was already in decline. It's a film whose confined location, string of pause-free verbal exchanges, final reveal to the whole cast and fondness for having characters walk into the room just when they can handily contribute to the conversation suggests it was based on a stage production. It wasn't, but the sense that you're watching a piece of filmed parlour theatre is hard to shake off. It starts with the final scene, so to speak, as the body of the oddly named Laura Van Ee (Molly Lamont) is brought before a philosophical coroner who looks skyward and wonders what her final thoughts were before she was "cut off by death." Fortunately she's good enough to elaborate, at least for the movie audience, but Laura obviously fancies herself as a bit of an afterlife novelist, unfolding her tale in a manner in which character and background detail only become clear (-ish) over time. Then again, this is also a story not told from her perspective at all, being plastered with conversations and incidents to which she could not have been privy. But we'll let that pass. One thing we do realise early on is that Laura is dealing with some serious issues and has changed from the woman she once was since she received a mysterious letter from abroad. Husband Ward (Roland Varno) has had enough and wants a divorce, while Ward's dad, the eminent psychiatrist Dr. Josef Van Ee (George Zucco), is trying to help Laura deal with her problems, whatever they may be. Also on hand and hired to watch over the premises is private detective Bill Raymond (Nat Pendleton), who's hoping for a murder to solve so they'll let him back on the force, and is smitten with sassy maid Lilly Beth (Gladys Blake), who has no time for his silliness. That all this is taking place in a house that was once an institute for the insane should surprise no-one. But we're just getting started here. A woman named Mrs. Williams pays the doctor a call and attempts to blackmail him with information on something-or-other, but the doc having none of it. A short while later he receives an unexpected visit from his old acquaintance Professor Leonid (Bela Lugosi) and his dwarf companion Indigo (Angelo Rossitto, who horror fans will recognise instantly from Tod Browning's Freaks). Leonid was a famous stage hypnotist who was previously an inmate of this very asylum, from which he escaped and fled to Europe. Ward also remembers him and asks if he knows the true identity of two dancers named Rene and Laurette, whose publicity picture he has stumbled across. He suspects Laurette may actually be Laura and has hopes that Rene, whoever he is, may still be married to her, which would invalidate his own marriage and enable him to dump Laura without further ado. The selfish and unsupportive git. From here on in things get more complicated and it becomes increasingly hard to tell the clues from the liberal distribution of sometimes peculiar and unresolved red herrings. The Doc gets knocked unconscious twice, Laura is sent a grotesque false head in a box, Lily Beth delivers a message whilst in a hypnotic trance and collapses on the spot, Indigo eavesdrops on almost every conversation and he and the Professor repeatedly nip in and out of secret passages or disappear into the bushes outside. Reporter Terry Lee (Douglas Fowley), an old pal of Raymond's, turns up with his ditsy girlfriend Jane (Joyce Compton), convinced there's a story in this house – God only knows how – and sets about trying to untangle the unfolding mystery, though the pair only add to the list of potential suspects. By this point you'll need a notebook and pen to keep track of who is suspected of what, where they are at any one time and frankly what the hell is going on. And intermittently throughout the proceedings, a mysterious masked face appears and floats ominously outside of the window. Paced as if the filmmakers were ordered to cram ninety minutes of story into just over an hour of screen time, neither the plot nor the characters are as well developed as they need to be in order to steer us through the mesh of incident and suspicion. 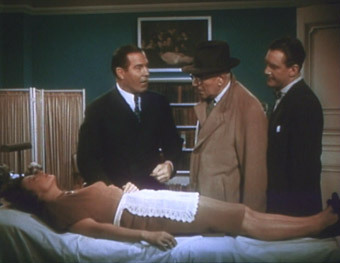 No one person takes centre stage for more than a couple of minutes at a time, and even the fated and largely unsympathetic Laura is sidelined for much of the film to allow the men to walk in and out of rooms and discuss what's been happening, for Lee to play detective, and for Jane and Raymond to compete for the badge of dumbest clod in movie, a too-familiar attempt at comic relief that falls flat on its face. Despite Lugosi's star billing, he's one member of an ensemble cast given roughly equal screen time. 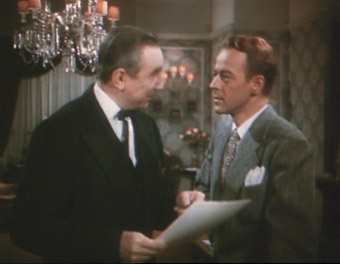 There are no real stand-out performances either, but Pendleton's thickie cop and Compton's dumb blonde aside, there are no real clunkers, and although Lugosi is soft-pedalling here, he does get to deliver one line with his customary relish – introduced to Jane he remarks with just a hint of malicious intent, "Delightful. I would suggest to take very good care of her..."
Scared to Death is a low budget B-movie built on a sound enough concept but in way too much of a hurry to effectively deliver on it. The characters are for the most part underdeveloped stock favourites, none them interesting enough to latch on to or worry about when they take their turn to temporarily disappear so that others can have their turn in the spotlight. Even the device of having Laura's corpse narrate the story has a rushed feel to it, with the same brief sequence popping up intermittently: dead Laura comes rapidly into focus, delivers a short line through voice-over like "Then came a sinister pair" or "A gruesome surprise was in store for me the following morning," and goes out of focus again, accompanied by the sort of wobbly ghostly singing you associate with 40s horror movies. It's a similar story for the spooky face outside the window, which appears almost randomly for a few seconds and is quickly gone, usually seen by no-one but us. And I know my colour vision may not be all it could be, but when Jane starts telling the others about this horrible green mask, I can't be the only one who noticed that it was almost the only thing in the green-tinted print that is a rather striking shade of blue. Framed at aprox. 1.30:1, the print on display here has seen better days, but not for a good many decades and Scared to Death is not the sort of film any restoration house is going to invest funds and time to return to pristine condition. The picture itself is soft and the colour has faded, or perhaps that should be drifted – the dominant shade here is green, which time has allowed to tint just about everything except for the walls of the doctor's office, the ladies' dresses and that floating blue mask. Dust and dirt are very visible, particularly at the reel changes, and there's also the odd bit of print damage. The contrast is generally OK, though, and there's very little movement of the picture in frame. In a couple of places there appears to be some flickering of colour, but I soon realised that this was down to a botched attempt to produce a flickering firelight effect on the characters – having had to do this one myself I know how tricky it can be to get right, but this one is way off. The transfer is, somewhat unsurprisingly, an NTSC to PAL conversion. The mono soundtrack inevitably betrays its age, with a limited dynamic range and the slight background crackle more prominent in places. The dialogue is generally clear, but it's a clarity level that sometimes alters with reel changes. All that's here is the Theatrical Trailer (1:41), which I'm surprised survives at all, let alone in such presentable condition. A reasonable 40s sell, complete with sensationalist claims thrown large on the screen, and it's nice to be reminded that the production was "filmed in natural color." An interesting murder mystery concept undone by the film's haste and characters who have the potential to engage and intrigue but who tend to go about their business without our emotional involvement. 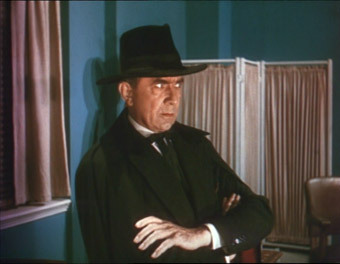 Still of real interest to Lugosi fans, though, for the rare chance to see him in "natural color." The print's not great, but at the bargain basement release price of just £2.99, it's hard to complain that much.